It’s Saturday – the end of the week! Since I do my grocery shopping on Sundays, by Saturday I’m at the bottom of the barrel food-wise. 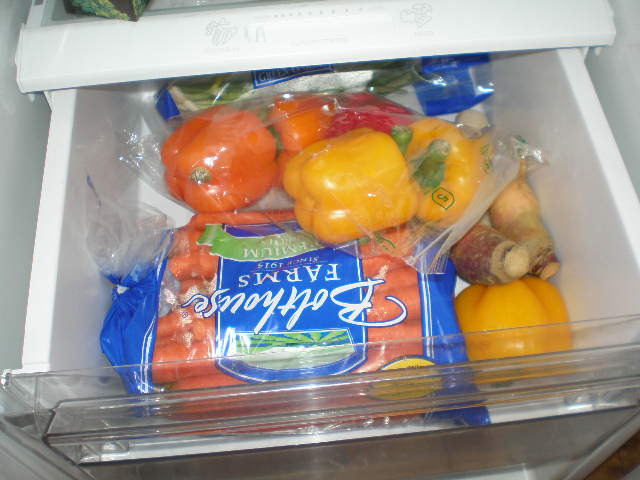 I probably have a few vegetables lying around that somehow did not get consumed during the week and need to be used up. This is a great time to make “End of the Week Roasted Veggies”. End of the Week Roasted Veggies is a really simple and healthy meal you can throw together with whatever you have on hand. It’s also a great way to use up veggies that are on their last leg. I have been making this dish a lot this winter because it’s very warm and comforting. I usually make it on the weekends because it does require a fair amount of time to chop all the vegetables. Chop vegetables ahead of time to make it faster on a weeknight. Assorted vegetables, any kind. 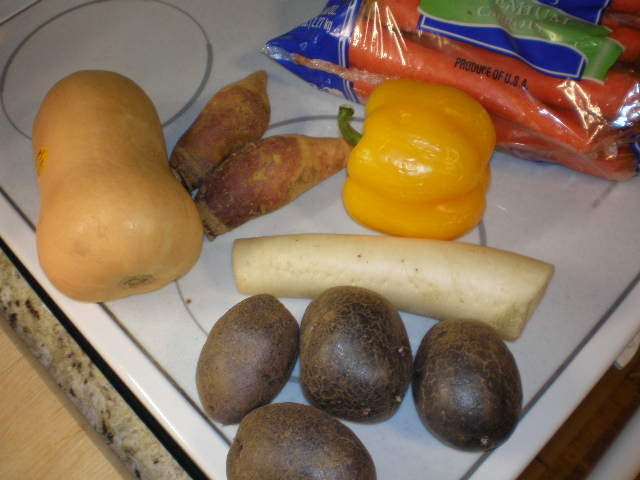 Some options are carrots, potatoes, sweet potatoes, onion, asparagus, zucchini, butternut squash, bell peppers, turnips, rutabegas, parsnips, or any other root vegetable I didn’t already mention. My drawer was actually pretty full. Much more so than normal during the off-season, but we just stocked up at Sam’s Club last weekend. From this drawer I pulled out the carrots, the yellow pepper in the bottom corner that was on its last leg, two rutabegas, and a daikon radish. I’ve actually never had rutabegas or daikon before and wanted to try them, so I picked some up on my last shopping trip. Now check your pantry for anything else laying around. 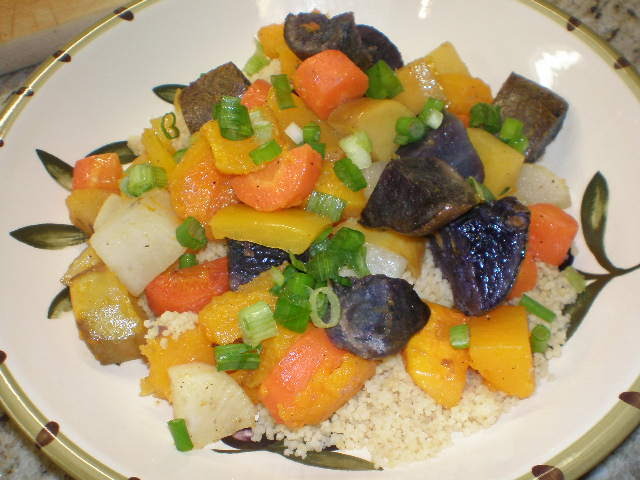 In my pantry I had a small butternut squash and some blue potatoes. I found these crazy blue potatoes at Whole Foods last Sunday. They are so pretty and unusual! Next get to choppin’. Get out a big bowl, a cutting board and your compost container (if you compost) and set them on the counter. Start peeling and chopping all the veggies into 1 inch pieces or so and throw them all in the bowl. All scraps go in the compost container. I peeled the daikon but did not peel the rutabegas. While you are choppin’ think about how awesome these vegetables are and how much your body will benefit from them. At some point during your choppin’, turn your oven on to 350 degrees F.
I saved the potatoes for last. 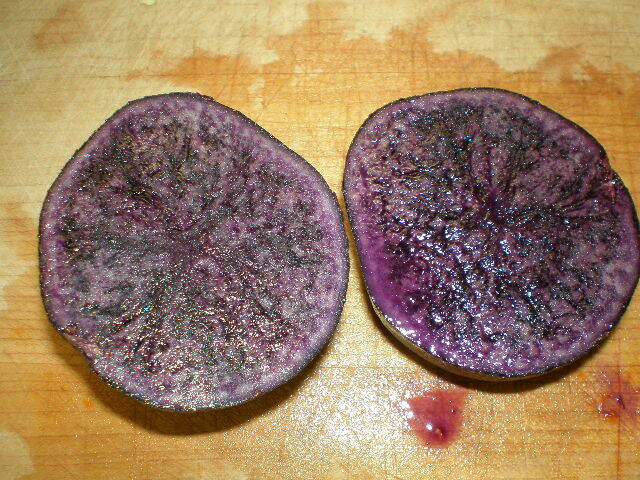 When I cut one open it was a brilliant purple inside! 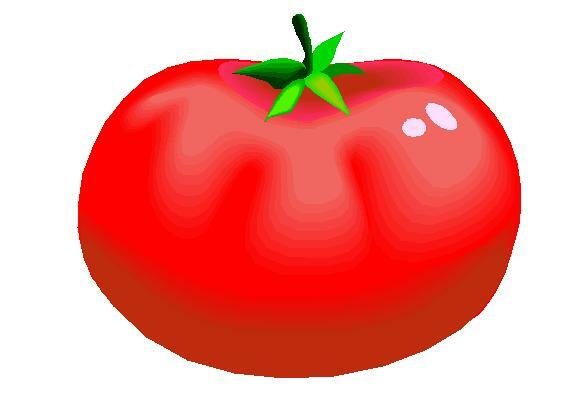 Is this not the most amazing vegetable you have ever seen??? After all vegetables are chopped and in the bowl, drizzle them with olive oil and season with salt and pepper. Stir it up really well to coat everything. Spread in a jelly roll pan. 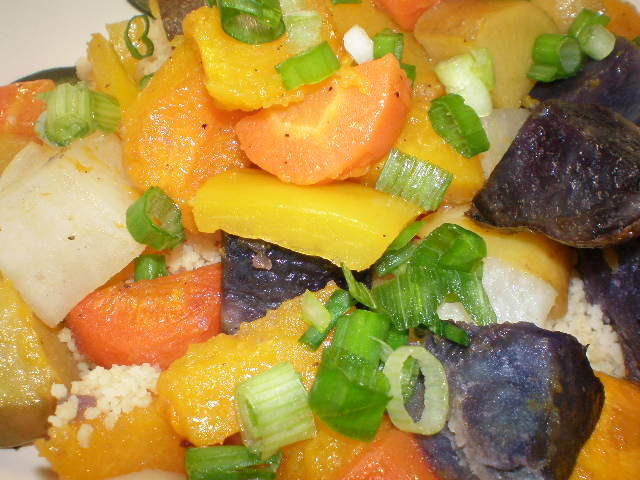 The purple potatoes really add a nice color to the mix. Bake this pan for approximately 30-40 minutes or until vegetables are fork-tender. Stir occasionally. Whole grains go really well with the roasted veggies. Brown rice, quinoa, barley or whole-wheat couscous are options. While the veggies are roasting, make your grain. I chose whole wheat couscous. Couscous is about the easiest thing to make in the entire world. I’ve never once screwed it up (unlike rice which can be finicky for me). In a small pan, bring the water and pinch of salt to a boil. 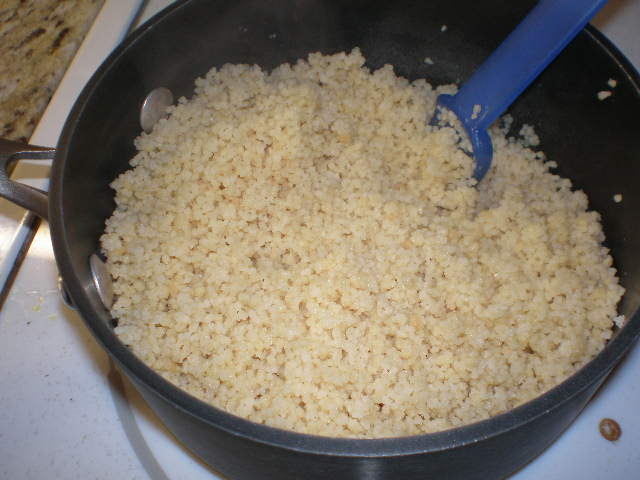 Remove from heat, dump in couscous, give it a quick stir and cover tightly with a lid. Leave it alone for 5 minutes. After five minutes remove lid and fluff with a fork. Voila! You could also use vegetable broth instead of water and/or stir in any number of spices to liven it up a bit. When the roasted vegetables are done, you can assemble it all on a plate or in a bowl. First spoon some couscous or other grain onto the plate. Then top with several scoops of roasted veggies. Finally top with whatever floats your boat. I used chopped green onions. 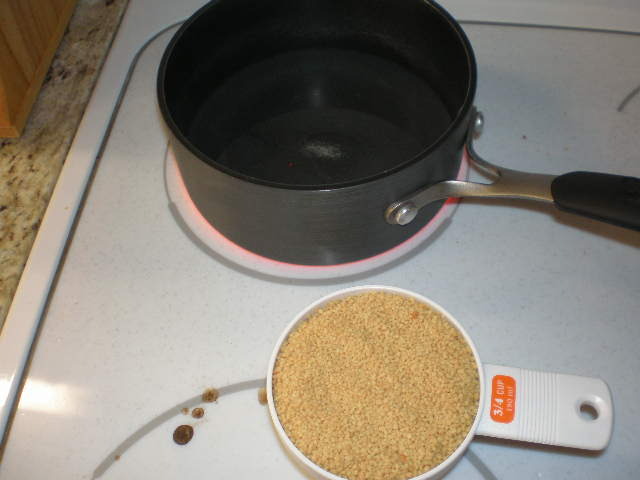 You could also try toasted seasame seeds or nuts, cilantro or parsley. Isn’t it pretty? I love all the colors! This is such a simple, easy meal that contains only whole foods. What’s not to love? End of the Week Roasted Veggies can also be Beginning of the Week Roasted Veggies too. Cook up a huge pan of roasted veggies and a big pot of grains on Sunday and then you can eat on it all week. Roasted vegetables are also good cold and could be eaten on top of a salad or in a pita pocket (they would probably stay in there a lot better than certain chickpeas). You could also put them on top of a pizza or in a wrap or sandwich. So versatile! I also want to say that you can make this dish with just two or three vegetables if that’s all you have on hand. I had a big variety this time, but I frequently make this with only squash, carrots and onion too. I thought the rutabega was a nice addition but didn’t care too much for the daikon. Benzo really liked the daikon, but then again he eats practically everything. 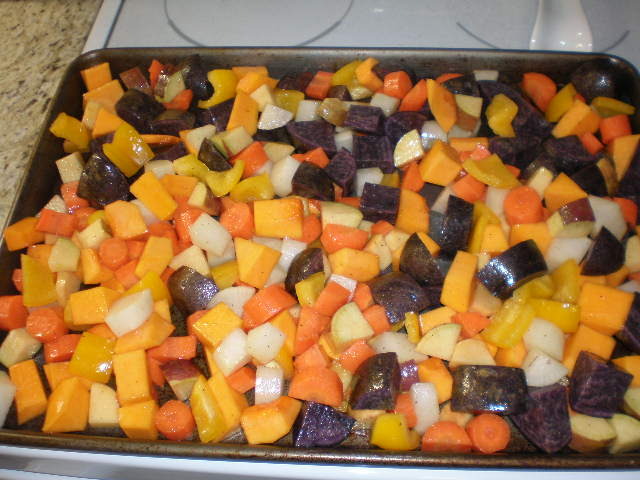 What would you put in your End/Beginning of the Week Roasted Veggies?